How Do Quality-of-Life and Gastrointestinal Symptoms Differ Between Post-cholecystectomy Patients and the Background Population? Negative Fine-Needle Aspiration in Patients with Goiter: Should We Doubt It? 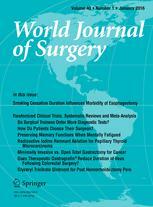 Duration of Smoking Cessation and Postoperative Morbidity After Esophagectomy for Esophageal Cancer: How Long Should Patients Stop Smoking Before Surgery?